Do you like to pin things on Pinterest? Do you like to do them? I'm trying to do the things I pin. "Trying." You can see if I fail or pass. Today's edition of "Pinned It and Did It" is a DIY Bird Bath. 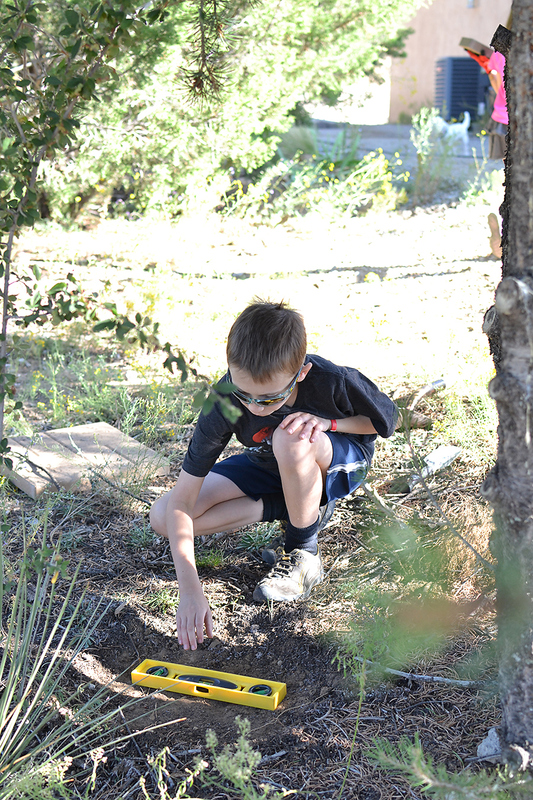 I wasn't planning on sharing this on the blog, so my photos aren't "blog-worthy." But, oh well. It was a fun project and I bet you could do it too. You might even be able to far surpass what we did. 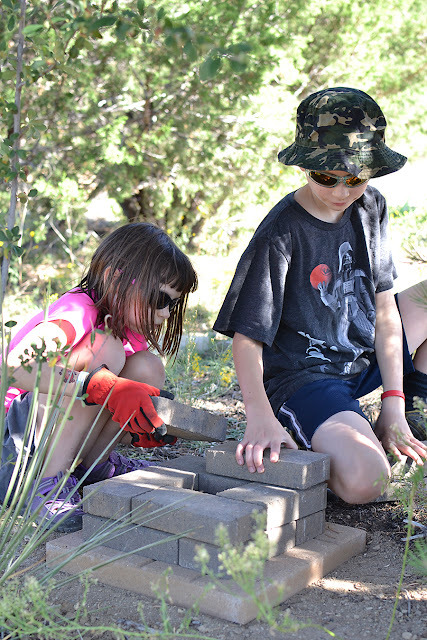 Plus, it's a great project for kids. It couldn't be metal that would rust out again. It had to be heavy duty. Well, I found metal ones. I found heavy concrete ones with squirrels and flowers. I found a stone one that sits on the ground with bunnies on it! I found a bronze one with an angel. I found ones that looked really cheap, but were still $30. I found ones that looked like they would blow over with the slighted bit of wind and we have wind that can take a staked trampoline out of the ground and throw it across the yard. I just couldn't find what I was looking for in a bird bath to purchase. Call me picky, cause I am. I wanted simple. I googled bird baths. I looked on Pinterest. I found this one. It's pinned in my house stuff pins. It's pretty awesome and it's my inspiration. 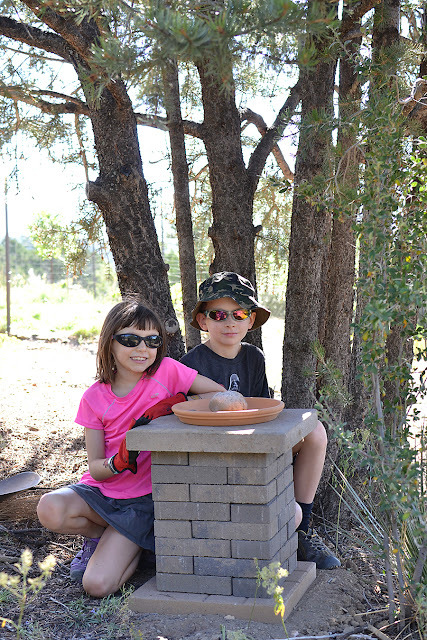 We already had two large patio bricks left over from a shed project and water barrel project. They didn't match, but that's alright. We use what we have. I went to Lowes and purchased the rectangular bricks during a Labor Day sale. I also bought construction adhesive to adhere the bricks together, but we nixed that idea. I calculated the cost of this to be around $30. You could probably even do it for cheaper if you can score some used stuff or a super duper sale. $30 was worth it to me, because this bird bath was way better than any I saw that we could purchase. Essentially this is like building with blocks or Legos. The kids were on this project like it was a new Lego set. I just had to get the materials and they did the rest. 1) Do a dry run of your bird bath to make sure it goes together like you want. 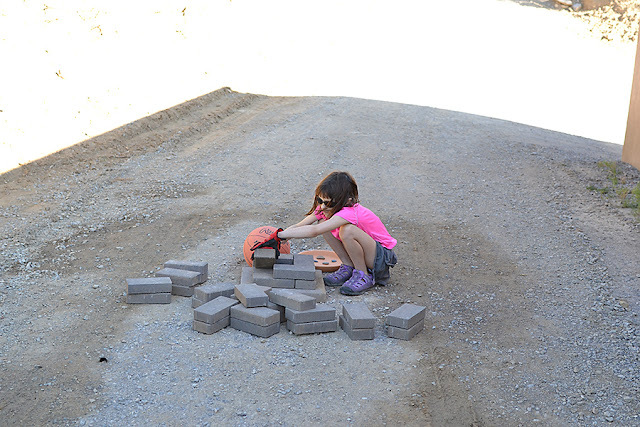 We may have had 3 or 4 dry runs, just because it was fun to build with the bricks. 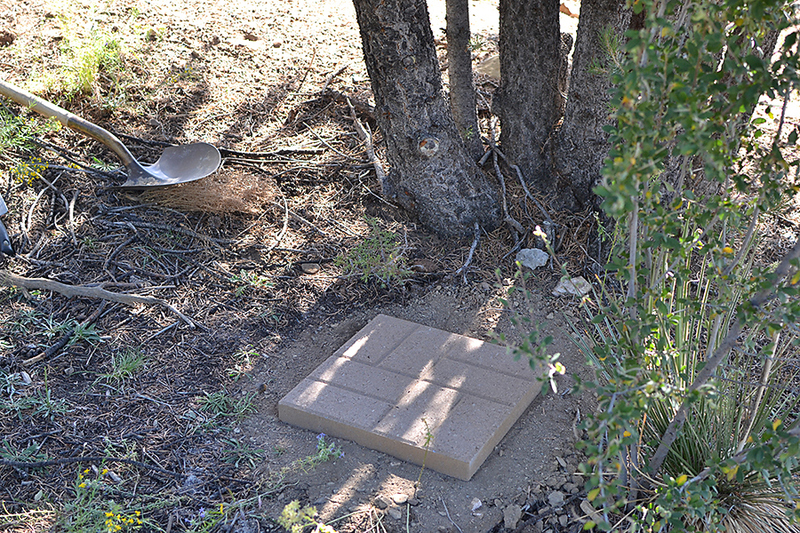 2) Find an area for the bird bath, preferably near a tree. Level the ground. 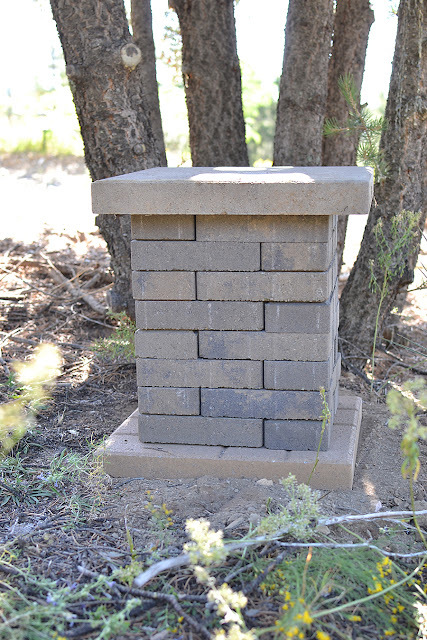 3) Lay your bottom patio piece and make sure it is level and completely covering the ground. 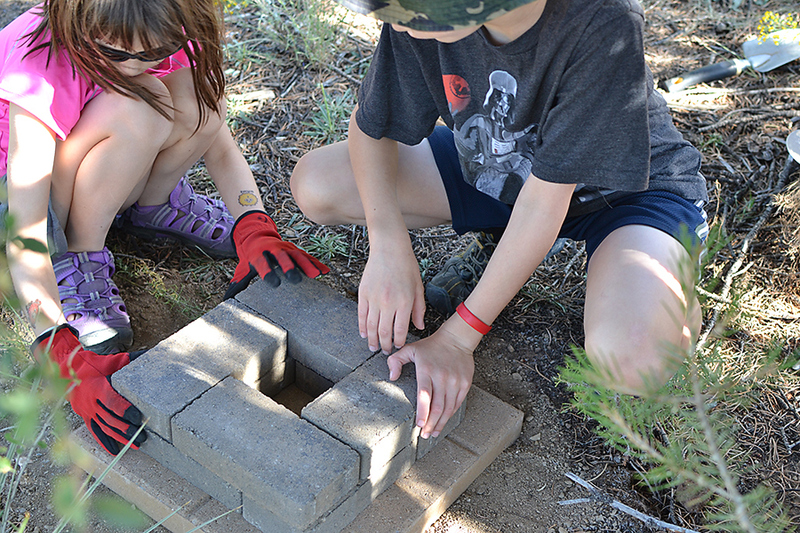 4) Stack your first layer of bricks into a square. 5) Alternate your second layer. 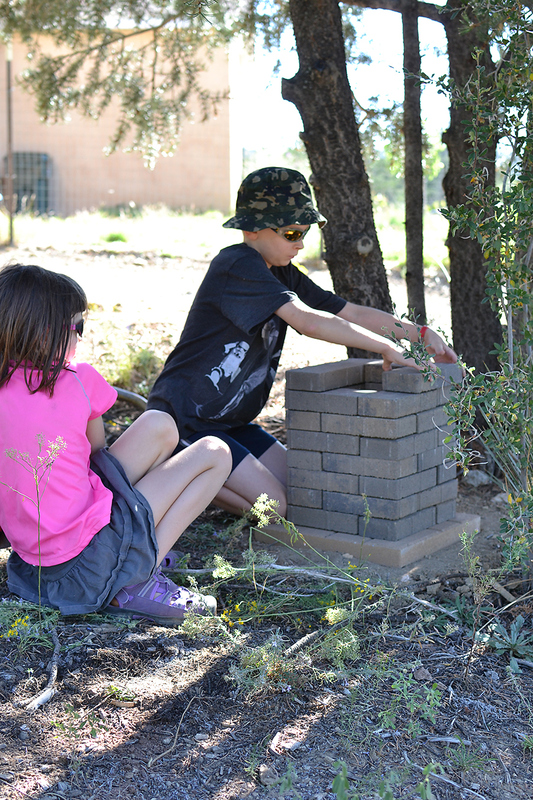 6) Continue alternating the layers until you have used all the bricks. 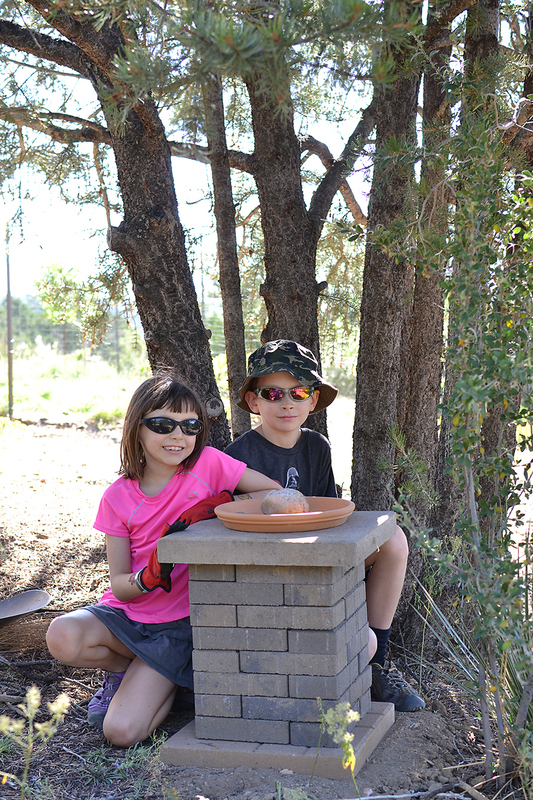 7) Place the last patio paver on top. 8) Admire the work of the wonderful bird bath builders. 9) Add your basin of choice and fill with water. We used a ceramic pot water catcher for our basin. It was cheap and I couldn't find what I was looking for. I was going to let the kids paint it and then I was going to seal it, but we were too excited to see it in use. We put it on without any paint or sealer and it's starting to chip to pieces in the cold weather. In the spring, we'll be looking for a new thrifty basin. You could use a large bowl, a serving platter, or anything that you can find that will hold water. The birds really like to have a rock in it to stand on. 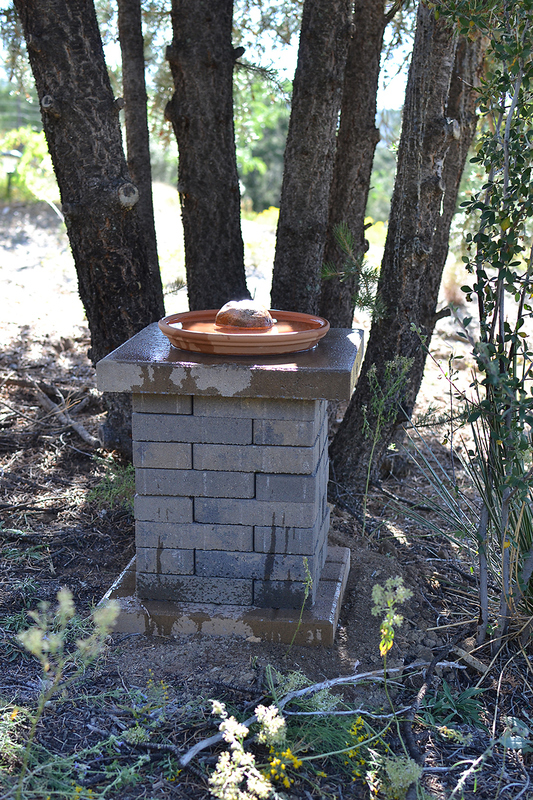 Also, it's still standing strong without construction adhesive and we can move or fix the bird bath if we need to. Here's a few snapshots taken from inside our house. 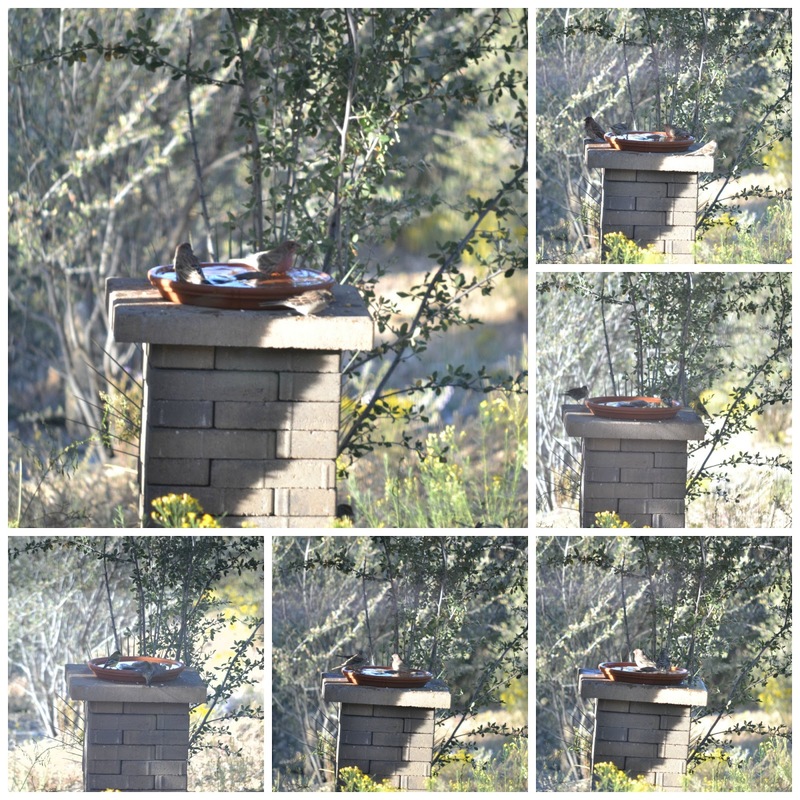 It's always lovely to put the bird bath in a spot where you can view it from the house. We can sit at our dining room table and watch the birds. It's better than actually having them in our house, though I'm sure the kids would love to have a bird. Our allergies just wouldn't appreciate it...or the dog. 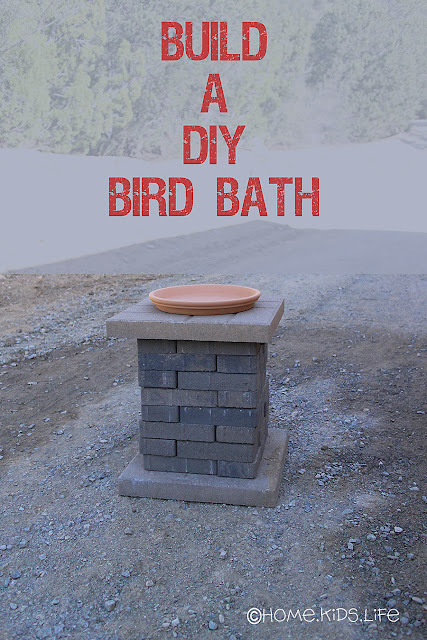 Have you made a DIY bird bath? What have you done? Or have you pinned something else and did it?